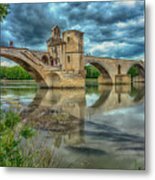 Pont D'avignon France_dsc6031_16 is a photograph by Greg Kluempers which was uploaded on July 25th, 2016. The Pont Saint-B￿zet, also known as the Pont d'Avignon , is a famous medieval bridge in the town of Avignon, in southern France. A bridge spanning the Rh￿between Villeneuve-l￿Avignon and Avignon was built between 1177 and 1185. This early bridge was destroyed forty years later during the Albigensian Crusade when Louis VIII of France laid siege to Avignon. The bridge was rebuilt with 22 stone arches. It was very costly to maintain as the arches tended to collapse when the Rh￿flooded. Eventually in the middle of the 17th century the bridge was abandoned. 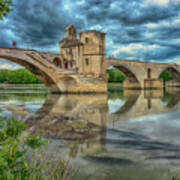 The four surviving arches on the bank of the Rh￿are believed to have been built in around 1345 by Pope Clement VI during the Avignon Papacy. The Chapel of Saint Nicholas sits on the second pier of the bridge. It was constructed in the second half of 12th century but has since been substantially altered. The western terminal, the Tour Philippe-le-Bel, is also preserved. 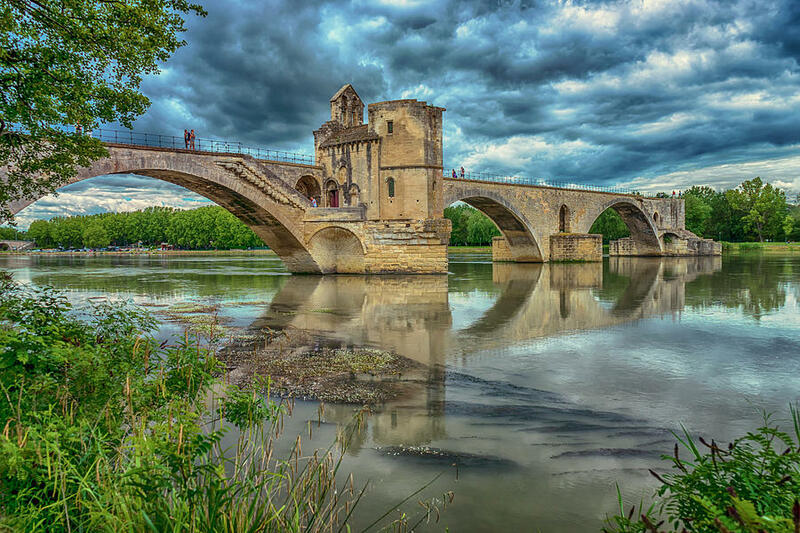 The bridge was the inspiration for the song Sur le pont d'Avignon and is considered a landmark of the city. In 1995, the surviving arches of the bridge, together with the Palais des Papes and Cath￿ale Notre-Dame des Doms were classified as a World Heritage Site.